Allen Jones is a British pop artist best known for his paintings, sculptures, and lithography. 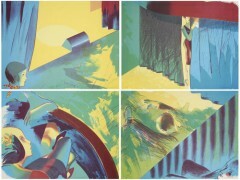 He studied at the Hornsey College of Art (1955-59 and 1960-61) and at the Royal College of Art (1959-60), where he became associated with the group of students around Peter Blake and R.B.Kitaj: David Hockney, Peter Phillips and Derek Boshier. The group reacting against abstract painting, found inspiration in popular culture, magazines, advertising and music.He was awarded the Prix des Jeunes Artistes at the 1963 Paris Biennale. He is a Senior Academician at the Royal Academy of Arts. Jones has taught at the Hochschule für bildende Künste Hamburg, the University of South Florida, the University of California, the Banff Center School of Fine Arts in Canada, and the Berlin University of the Arts. There have been three major retrospectives of his work. His work has been shown in many exhibitions and can be seen in most major collections around the world . 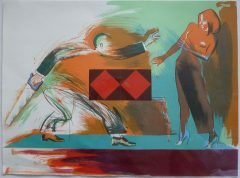 Allen Jones lives and works in London and Oxfordshire.